While I have nothing against the players, their talent, and their accomplishments I do have a problem with college football as a system. The SEC has won the last seven national titles, and you can give credit for that success to their ability to cheat. When it comes to football, SEC teams cheat better than any other conference. Winning at the Division I college level is mostly–I’d say 70%–about getting the best players. The SEC consistently gets the best talent. For the sixth year in a row, more players were drafted into the NFL from the SEC than any other conference. Having the best players gives you a better chance at winning titles. But how do they get them? Through under-the-table deals involving alumni, boosters, parents, and others. Remember how Cam Newton’s dad tried selling his kid to Mississippi State? The Kansas City Star’s Kent Babb writes about how the coach of high school recruit, Albert Means, sold access to his player, and a booster forked over $150,000 to get Means to go to Alabama. The SEC no longer has any schools under probation, but do you think they’re all on the up-and-up? If so, I have a bridge in Brooklyn to sell you. Is it a coincidence that Auburn hasn’t been very competitive since the Cam Newton scandal came out? Or do they know they’re under a watchful eye and have to be careful? Being more careful when other schools aren’t means Auburn is at a comparative disadvantage in recruiting. Do I think Notre Dame doesn’t cheat? No, I’m sure they do too. As well as my Wisconsin Badgers. Brent Bielema, former Wisconsin coach, found a legitimate way to get Russell Wilson to play one season for the Badgers. I’m sure his ability to bend NCAA rules to his will crossed the line at times, and thus why Arkansas was willing to hire him. They think he can cheat–I mean recruit–with the big boys. The problem with Notre Dame and Wisconsin (and the Big Ten, minus former Florida coach Urban Meyer) is they just don’t cheat as well as SEC teams. 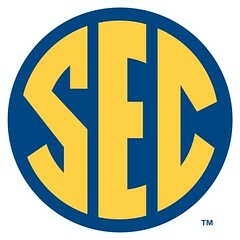 With ESPN’s deal to show SEC games, do you think they’ll ever really dig into why the SEC has dominated the way they have? I doubt it. Since Division I schools are essentially minor leagues for the NFL, let’s be honest and make them so. Spin off college football programs into independent enterprises (either for or non-profit) and pay the players. Let boosters pour in as much money as they want into their teams. Let players hire agents and get the best deal they can get. College football evolved from a form of rugby into a fall Saturday obsession. It will survive further evolution. Let’s finally be honest about what really is going on. Image: Tennessee Journalist via Flickr. This entry was posted on Tuesday, January 8th, 2013 at 3:22 am	and is filed under Sports. You can trackback from your own site.